Rabih Beaini aka Morphosis is a Lebanese electronic and experimental musician based in Berlin. He is also the founder of the label Morphine Records, which has released albums by such artists as Charles Cohen, Hieroglyphic Being, and Anthony “Shake” Shakir. In this recommendation from our Winter, 2013 issue, he assesses the afro-futuristic techno of DJ Stingray and Gerald Donald’s NRSB-11. Interview conducted by A.J. Samuels. DJ Stingray, aka Sherard Ingram, has long been one of the principle figures in electronic music for me, particularly his releases with Urban Tribe and with Anthony Shakir. Some years ago I released a 12-inch by Anthony on my Morphine label, and one track was co-produced by Sherard, but until a few weeks ago, when I met him in Tokyo, we had yet to have a proper conversation. Listening to his set in Unit, I realized how difficult it is to describe what he does in depth and that also goes for acts like Drexciya, Gerald Donald and Gerald’s various side projects. In contrast to people like Jeff Mills, Anthony, or Derrick May, whose sound you could broadly define, Gerald and Sherard—who make up NRSB-11—are after something more mysterious. The music is based in science, science fiction and futuristic concepts, and NRSB-11 live the music in a way that’s ahead of our times. It’s similar to how good science fiction always remains ahead, even when it’s old. Take Blade Runner for example: if you watch that today it still seems futuristic, and you’ll always think it’s made for a future that hasn’t come yet. It’s timeless, not unlike Metropolis. And that’s something I hear on Commodified. Much of the album centers on hidden messages from parallel worlds—political, financial and extraterrestrial. American afro-futurism has a long history of discussing the cosmos and planetary events in relation to the political state of affairs of black communities in the U.S. and their oppression by the White House and CIA. The Detroit techno and electro scenes added to this history by preaching black power and supremacy, including for other non-white minorities. I’ve been to Detroit, and you can still feel the necessity of their position, maybe even more so today than ever before. 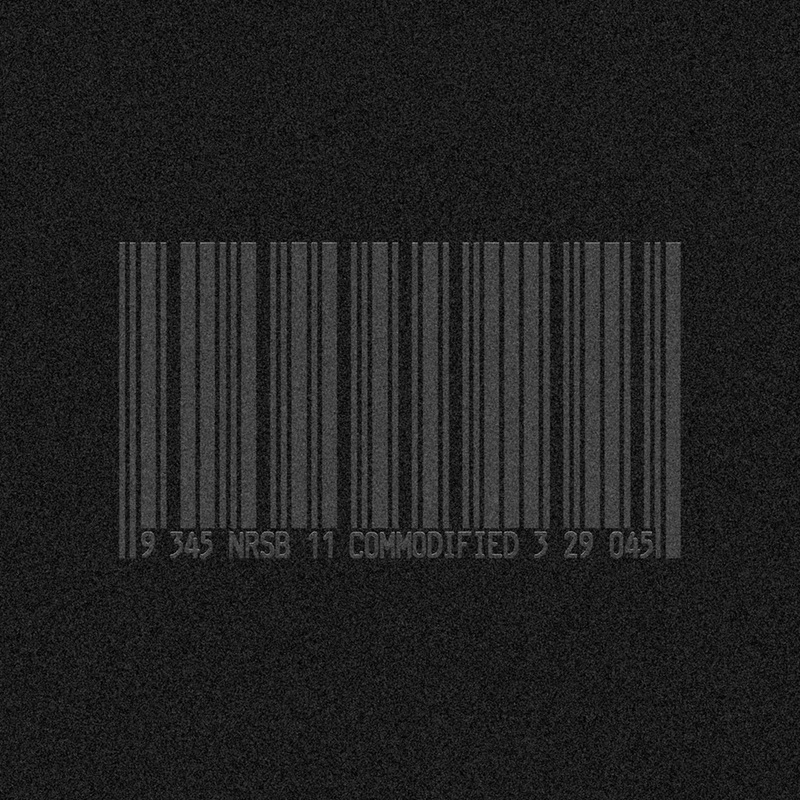 In terms of Commodified, which uses sci-fi as a vehicle for political allegory, a story is told in the tension of the rhythms and production, as well as the album’s song titles, like “Consumer Programming”, “Offshore Banking”, “Industrial Espionage”, or “Austerity”. Sherard explained to me that the album took a year to make, and you can hear it in the extreme attention to detail. Importantly, the collaboration was remote, also with the two transferring files back and forth—which is very different than how I usually work. While I think it’s interesting to work in close quarters with someone else, I imagine working at a distance can bring better results for a few different reasons: First, the process itself is related to current technology and is classically futuristic in terms of electronic music production often taking place in private bedrooms or small studios. Second, collaborating in the same room can involve making concessions to avoid confrontation. Trading files has the potential to result in something more mature. The distance keeps you honest and critical and that’s another interesting paradox that I associate with NRSB-11: it’s an extremely detailed collaboration taking place thousands of kilometers apart, based around a futurism that’s fundamentally historical. This text first appeared first in Electronic Beats Magazine N° 36 (4, 2013). Read the full issue on issuu.com or in the embed below.